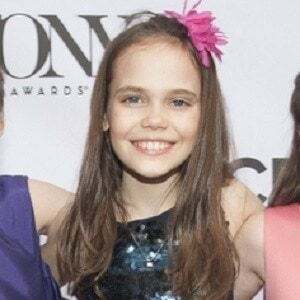 American youth theatre actress who was cast in the title role of Matilda Wormwood for the Broadway adaptation of Matilda. Active as an actress since 2009, she performed in productions of To Kill a Mockingbird and Seussical the Musical. She received a dance scholarship to the Harkness Center for Dance. She has younger sisters named Aimee and Jete who are also actresses. She played the younger version of Taryn Manning's character in a season three episode of Orange Is the New Black.